1. Heat a large Dutch oven over medium-high heat. Remove casings from sausage. 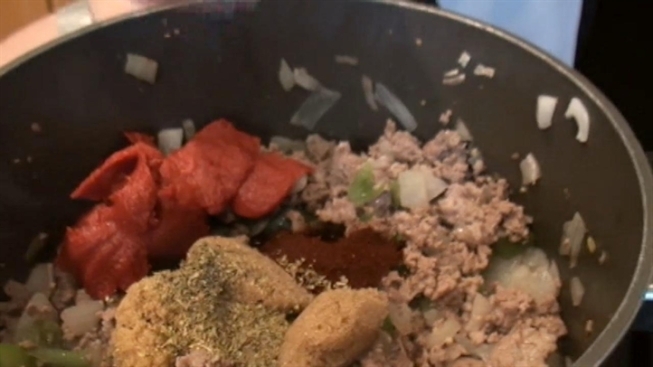 Add sausage, onion and next 4 ingredients (onion through jalapeno) to pan, cook 8 minutes or until sausage and beef are browned, stirring to crumble. 2. Add chili powder and next 7 ingredients (chili powder through bay leaves) and cook for 1 minute, stirring constantly. Stir in wine, tomatoes, and kidney beans, bring to a boil. Cover, reduce heat and simmer for 1 hour, stirring occasionally. 3. Uncover and cook for 30 additional minutes, stirring occasionally. Discard the bay leaves. Sprinkle each serving with cheddar cheese. Note: Like most chili, this version tastes even better the second day.